Other ingredients: Soybean oil, Beeswax, gelatin, water, titaniun dioxide, Chlorophyllin. Suggested Use: 4 in the morning and 2 at noon. Memory Revitalizer: Worth using even if your memory was never devitalized in the first place. 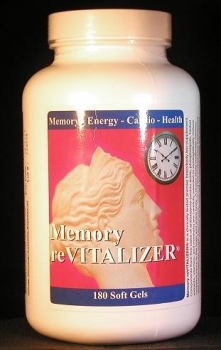 Memory reVITALIZER® does much more. It is a complex 35 antioxidant blend designed to impart synergistic benefit. This allows lower effective doses with less potential side effect. Improving cerebral vascular flow was intended by inclusion of eleatherococcus senticosus, ginkgo biloba, panax quiquefolium, centella asiatica, grape pip(vide supra) and magnesium citrate. Prevention and repair of lipid peroxidation was addressed by inclusion of alpha-lipoic acid, d-alpha tocopheryl succinate, mixed tocopherienols, ascorbic acid, vitamin A palmitate, beta carotene, lemon bioflavanoids, L-glutathione, l-lysine, phosphatidylcholine, phosphatidylserine, pyridoxine, riboflavin-5-phosphate, and selenium methiodine. Enhancement of superoxide dismutase and reduction of serum homocysteine was targeted with copper sebacate, folic acid, manganese citrate, l-methionine, methylcobalamin, pyridoxine. Addressing free radicals of nuclear origin, mitochondrial metabolism, or post translational protein production was intended by inclusion of ascorbic acid, beta carotene , boron, coenzyme Q10folic acid, magnesium citrate, methylcobalamin, niactinamide, pyridoxal 5'-phosphate, and taurine. Other positive synergies exist within the formulation. It is beyond the scope of this brief statement to give further detail.